The best way to have trouble-free maximum growth for your new plants is to start them in properly prepared soil. With Bio-tone® Starter Plus you can plant and relax – knowing you have given your plants that perfect start and done it without harsh chemical fertilizers. 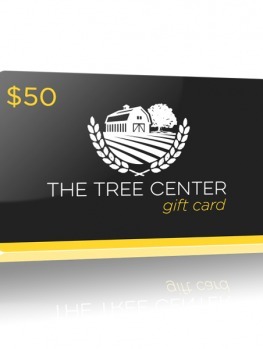 This remarkable product is designed to feed your plants and your soil, and establish healthy fungal relationships between the plants and soil, using the most up-to-date concepts and understanding. Bio-tone® Starter Plus is especially recommended for poor, degraded soil, for example around a new-build, or in a development. Construction activity severely damages the delicate ecology of soil, and this can take years to restore itself naturally – if it ever does. But this quality product is incredibly valuable in all soils, no matter how good you think they are. By adding exactly the right blend of minerals and biological supplements, any soil will become better balanced, with an intact ecological system that supports and nurtures all your plants – in a 100% natural way. Bio-tone® Starter Plus is a complex blend of many ingredients, all chosen to optimize the rapid establishment of your new trees and shrubs. It begins with a blend of poultry feathers, poultry manure, alfalfa meal and other organic materials that provide the 13 essential nutrients in a safe, non-chemical form, slowly released as your plants need it. Copious quantities of soluble minerals that can contaminate ground water are never released, as they often are with chemical fertilizers. Instead, the steady supply of nutrients is rapidly absorbed by your plants or used by beneficial soil-conditioning microbes. Added to the mix of organic materials are many colonies of microbes, to break down the materials and release nutrients. These are especially important in poor, degraded soils when microbe activity is minimal. These inoculants rapidly invigorate the soil, stimulating other organisms and creating a viable, complex ecosystem in your soil. Others act as biological pesticides, coating the roots with protective materials that stop the germination of disease spores and protect the roots during this vital establishment period. As well, Bio-tone® Starter Plus contains ectomycorrhizal and endomycorrhizal fungi. These amazing organisms live on and inside roots, acting as nutrient conduits into the plant, and providing other complex molecules too, in return for the safety provided by the roots. This symbiotic relationship between plant and fungus enables plants to grow in poor, degraded soils, and it can be seen at work in nature on sand-dunes, gravel soils, and other poor environments. If you have ever wondered how those plants survive, mycorrhizal fungi are the answer. By adding them along with organic supplements, they quickly establish in the roots of your plants, making them better able to adapt to difficult environments. When you use Bio-tone® Starter Plus for every tree and shrub you plant, you are giving them the best possible start in your garden and feeding your soil too. In years to come you will have great plants and a garden to be proud of. Plants will develop a larger root mass faster, protecting them from drought and enabling more rapid crown growth. 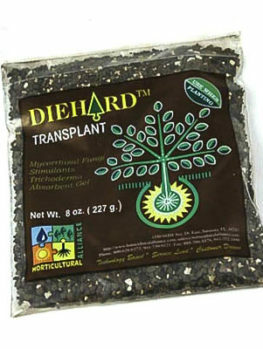 Transplant losses are significantly reduced too, and you can use this starter for everything you plant – trees, shrubs, evergreens, and flowering plants too. This amazing product is easy to use. 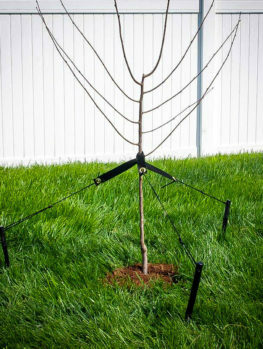 When you are planting your new trees or shrubs, simply mix it at the rates shown below into the soil you removed from the hole, and that you are now firming down around the roots of your new plants. The convenient 5-oz. packet makes it easy – just choose the right number for your pot size. 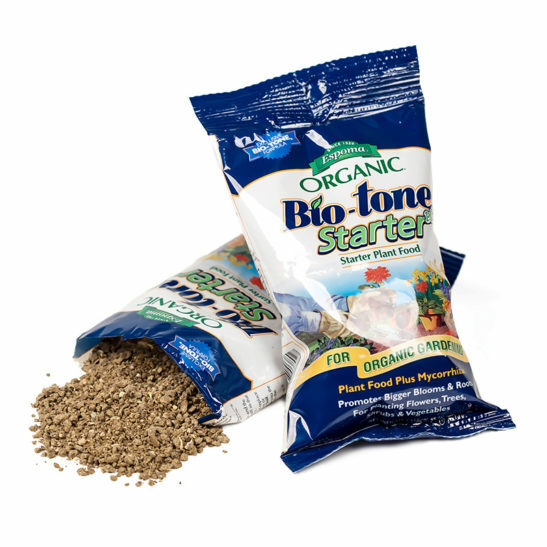 Mix the contents of the packet with that backfill soil, and automatically, when you water, the microbes in Bio-tone are activated and get to work on the rich blend of organic components in the product. Almost immediately nutrients begin to flow to your plants, helping them establish quickly and begin growing. Regular watering and good soil preparation with manures and composts will help the process along. There is nothing more you need to do – except watch your new plants take off. The core component of Bio-tone® Starter Plus is a careful blend of traditional and modern organic materials that slowly release just the right balance of nutrients for optimal growth. 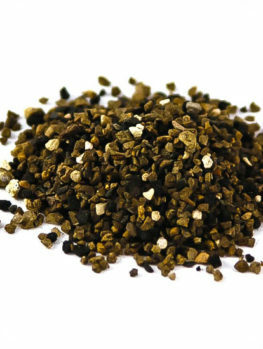 Hydrolyzed Feather Meal – feathers are a long-term source of nitrogen, and blend well into soil. They are slow to break-down, so special bacteria have been added to accelerate this process. They have been hydrolyzed too, a process using water and enzymes to open up the structure for efficient breakdown. This process also sterilizes the feathers, so they are never a health risk. – this is a long-established natural fertilizer, packed with all 13 essential nutrients for plant growth. It breaks down at a moderate rate, thanks to the added bacteria. It contains 40-60% slow-release nitrogen, which is available for growth gradually, never burning roots or shoots. It is also a valuable source of calcium, for vigorous growth of root tips and buds. For health reasons this material has also been carefully pasteurized. Bone Meal – a traditional organic source of phosphates, the foundation of root development, and essential for the establishment of your plants. Bone meal has a long history of use in agriculture and gardening, and it is the soil additive of choice when planting organically. Again, this material has been steamed for the safety of you and your family. Alfalfa Meal – another top-grade product used by organic gardeners everywhere. Alfalfa meal contains all the essential nutrients, and it is a major source of slow-release nitrogen. This is a vital nutrient in starter fertilizers, since new plants use lots of it making healthy roots and adding inches to their height – inches of healthy foliage and stems, not weak, spindly growth. It also feeds the microbes in your soil, including the special kinds found in Bio-tone, building larger populations that can then work for you in building the top-grade soil that grows top-grade plants. Humates – a key role of organic material in soil is ‘soil conditioning’. This is the process that binds soil particles together, improving both drainage and air penetration, and fighting soil compaction. Better drainage means a reduced risk of root diseases, and more air means more rapid and healthy root growth. Humates are the long-lasting end-product of compost making, and their acids and gums bind with soil particles to create better quality soil that is closer to the ideal loam-type, even if your soil is very sandy or full of clay. Greensand – the residue from the floor of millions-year-old oceans, greensand has been used for hundreds of years to condition soil. It is rich in glauconite, an iron-potassium-silicate type of mica that gives the sand its natural green color. This complex mineral is long-lasting in soil, and it improves drainage by pushing apart the tiny clay particles and letting water flow more freely. Clay soils are full of minerals for your plants, but poor drainage inhibits root growth, so they cannot be utilized. By opening up the soil structure, greensand releases that huge store of minerals too, so they are available. The result is greatly improved establishment and growth. Potassium – after nitrogen and phosphates, potassium is the third essential nutrient needed in large quantities. Added here as the natural mineral sulfate of potash, this nutrient builds strong stems, resilient leaves, thicker cell walls, and greater resistant to disease and sucking insects. Magnesium – along with calcium, magnesium is an essential nutrient for chlorophyll development – an atom of this element sits at the heart of every chlorophyll molecule. It has been added as sulfate of potash magnesia, a natural mineral called called langbeinite, which is 11% magnesium. Slowly released over time, magnesium is a full 1% of Bio-tone starter – a great builder of healthy green leaves. The breakdown of organic sources of the essential plant nutrients depends on the activity of specific, beneficial soil bacteria. There is no guarantee, especially in degraded soils, that those necessary microbes will be present. This careful blend of materials can sit in the soil, without being broken down. 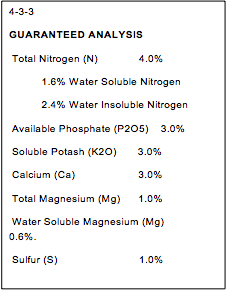 So Bio-tone® Starter Plus contains 936 colony forming units per gram of three species of bacteria. CFUs are a technical measure of bacteria, measuring only live cells, which rapidly proliferate once Bio-tone is activated by adding it to the soil, and watering. Bacillus licheniformis – this microbe has the specific enzyme systems needed to breakdown the dense, durable proteins in poultry feathers, releasing the nitrogen and other nutrients into the soil, and feeding many other essential microbes. Without this organism the breakdown of feather is too slow for effective use as a plant fertilizer. Bacillus megaterium – an ability to trap atmospheric nitrogen and turn it into useable plant forms is just one of the special tricks this bacterium can perform. It also lives on plant roots, protecting them from diseases, and has the ability to thrive in salty soils where other microbes perish. Like other soil microbes it can efficiently degrade the organic blend of Bio-tone, efficiently releasing nutrients. Bacillus pumilus – besides breaking down organic materials to release nutrients, this bacterium is present here to protect roots against soil-borne diseases like Rhizoctonia and Fusarium fungi. The risk of these attacking is highest with newly-planted trees and shrubs, since there is inevitable root-damage during planting, creating a gateway for the germination and penetration of fungal spores. With this microbe present, your plants are protected. There was a time when fungi in the soil were viewed as either harmful to plants or living independently of them. Today we know differently – many trees and plants have intimate symbiotic relationships with fungi. These fungi live on the root system, wrapped around the smaller roots (ectomorphic mycorrhiza) or penetrate between the cells of the roots system (endomorphic mycorrhiza). At least 85% of plants, including many of our most important crops, have endomorphic fungi, which probably developed when plants first came on land. The fungi and plants exchange nutrients, and plants with these symbiotic relationships grow faster and stronger, especially in poor soils, where the fungi can obtain nutrients which the plants cannot. Degraded soils often lack the spores for these mycorrhizal relationships to develop, so by adding a cross-section of suitable species to the mix, Bio-tone® Starter Plus ensures your plants can develop well, taking advantages of this amazing symbiotic activity. They will thrive and grow much better in all soils, but especially if you are planting in poor soil. Both ectomorphic and endomorphic species are included, so that you get the best possible chance of a healthy relationship developing. 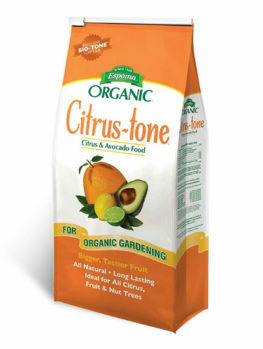 Taken all together, this blend of ingredients produces the ideal organic starter fertilizer and soil conditioner, so that no matter what your soil is like, or what plants you are growing, they will have the best chance of rapid and effective establishment. The small investment will repay you over and over again, so add this terrific product to your order, for great results.